Multi-talented singer-songwriter Melanie DeMore will perform a free public concert at the HSU Kate Buchanan Room on Saturday, April 1, at 7 p.m. DeMore’s mission? “To make sure you unlock the key to experiencing yourself in all your glory,” writes the self-described vocal activist. Melanie DeMore plays in the Kate Buchanan Room on April 1. DeMore is a renowned singer, composer, music educator, choral conductor and activist whose music is infused with messages of hope and reconciliation. She was a founding member of the Grammy-nominated vocal ensemble Linda Tillery and the Cultural Heritage Choir. Those who participated in the January Women’s March on Eureka will remember her song, “One Foot / Lead with Love”, as the anthem sung by thousands of participants. 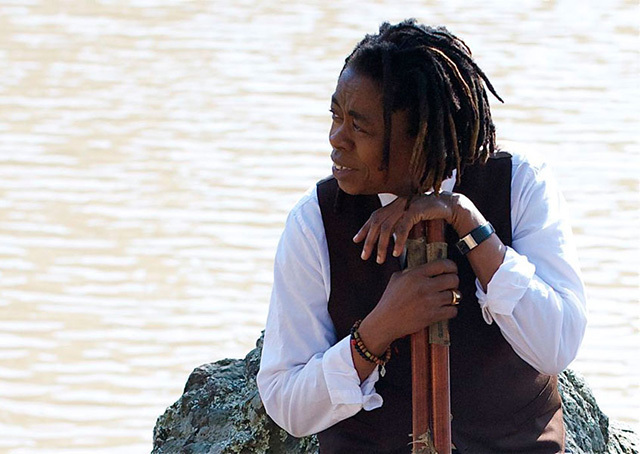 In addition to her solo work, DeMore, who describes herself as a “songwriter, troubadour, and an emissary of tolerance,” facilitates vocal workshops for professional and community-based choral groups and has taught her program called “Sound Awareness” in schools, prisons, and youth organizations in the US, Canada, Cuba, and New Zealand. DeMore’s performance is sponsored HSU Multicultural Center, the Humboldt Unitarian Universalist Fellowship, and Coast Central Credit Union.